XMind 7 is currently in Beta (until end of November 2015), but we can still talk about the new features and updates that will be part of the newest version. The people over at XMind posted a list of all the new features. I've copied over some text directly from that post, and I'll use it as a starting point. XMind's promo blurbs are italicized and my thoughts follow. A new toolbar with new large icons. A more clear style of the window. Re-designed tab bars. A more clear style of the Properties View. Improved markers and clip art library. It’s the biggest upgrade from our first release! We try our best at look-and-feel on XMind 7 and believe it will inspire you! There's definitely a sleeker and more modern look to the user interface (UI). XMind has gone to a flat look, which is a trend we're seeing across more tools. XMind already has one of the most visually appealing UIs out of the box and this new update keeps them moving forward. One thing I noticed the first time I started XMind 7 is that fact that the Open link on menu bar is gone. I love using short cuts (Ctrl+O), but for some reason, I like using the open icon on the menu bar more than I do in other programs. I think it's because I have my hand glued to the mouse more than in other programs. I'm a fan of reducing menu clutter, but I might suggest that the open short cut stays. Every time you start XMind 7, the brand new Home Panel serves you. With the panel you can create mind map from structures, choose an elegant theme, open recent used files. You can also pin a file, in order to see it every time before you work. I like the ability to choose exactly which format you want to use by visually seeing it. 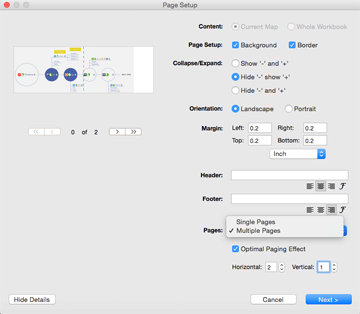 The Home screen lets you toggle between blank map views and the available templates. 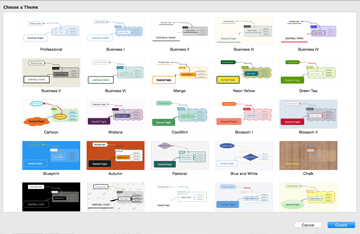 I have a few mind maps I constantly use, so I always want XMind to open my “Main” workbook. I noticed that the current version of the beta displays the home screen for a few seconds even though I have it set to show my personal map. That's probably something they'll tidy up before the final release. 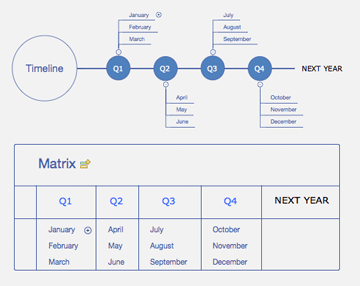 Converting Mind Maps to Gantt Charts, is one of the best practices of project management. Now you can add/modify task info directly in Gantt Chart view, including start/end date, assignee, priority and progress. 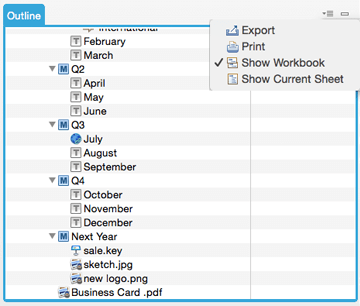 XMind 7 also allows exporting Gantt to images/PDF, or printing it. Being able to print (including to PDF) a Gantt chart is a huge win. I've had several email discussions with users about this topic over the past year. It's an item I've had on my wishlist for new features. The other change to the Gantt view is the added ability to update some information right in the timeline view. Now you don't need to go into the Task View to make all those changes. Those features may seem small, but those of you who use Gantt charts on a regular basis will be all over this. 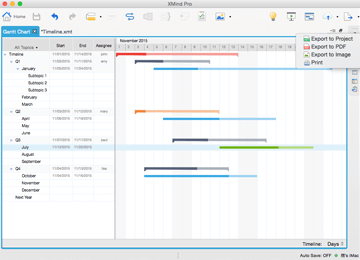 FYI: Gantt charts are only available with Pro version, but you can test it out while XMind 7 is still in beta until November 30, 2015. 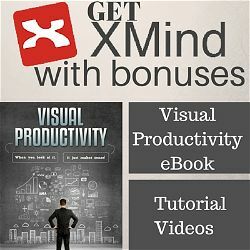 XMind 7 provides a better way to show detail information. We call it an Information Card. 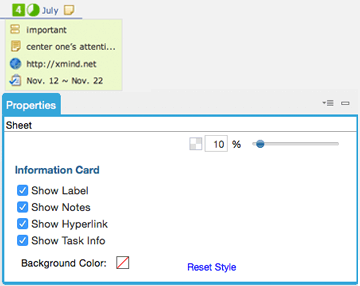 In Information Cards, you can choose to show or hide labels, notes, hyperlinks and tasks. It's found directly under the topic. This a cool feature that I think won't get much love, but this makes plenty of sense. I like labeling topics in XMind, but the downside is that the label makes that particular topic (node) higher. That means the look of the map gets weird if you add too many. A lesser-known benefit of labels is the ability to use them as a filtering tool. I can see information cards being useful for when you're demonstrating a map and don't want to be distracted by extra detail. I'd also use then before I take a screen shot of what I'm working on to send to a colleague to reduce the clutter in the image. What would be really good is if you could hide all labels, notes, and hyperlinks across an entire map. I actually couldn't find this feature in the version of the beta I'm working on. If you find it, leave me a comment and let me know where it is. I haven't tried it yet, but I like the idea behind it. You may send your inspirational thoughts within an XMind file to your colleague or a friend. Ask for their comments. And in XMind 7, they can actually Comment on your mind map, instead of modifying the map directly. Sometimes, no comment is a comment. I like the comments feature so far. XMind has needed a collaboration tool like this where notes can be fixed to certain nodes. This seems to fit the bill. A tool like this is huge for getting feedback from a team, or starting a discussion with others on a shared map. 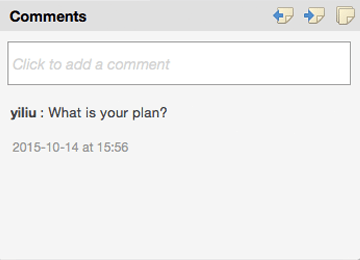 This feature lets you add a comment directly to an individual topic. It looks similar to a note (just to the right of the text), so you can see which topics have comments by looking at the map. You can also see all comments in a separate window, which makes it much easier to review and act on any recommendations. Each comment is tagged with the name you use as part of your XMind setup, so you even know who's saying what (as long as everyone uses their own computer to comment). One point to look into. I would have liked to been able to click on the comment and use the Delete key to remove it instead of having to right click and select Delete from the menu. That seemed like too much work to delete. Callout is a funny way for additional text. 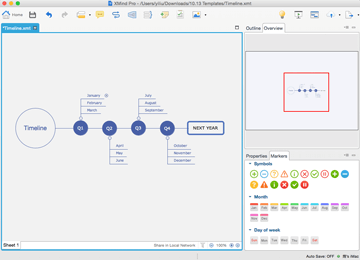 In XMind 7, Callout is not only a shape, but also a real attachment to a topic. It also has sub-topics. What? Callouts can have sub-topics? This is a great feature. What a slick way to add extra information and catch your attention, without having to create a label, or another topic. The callout catches your eye, as it looks like a text dialogue box from a cartoon. It's speaking right to you. The ability to add child topics lets you add more detail to whatever you're drawing attention to. A callout is similar to a Floating Topic in my mind (A topic that's not attached to anything), except that the callout is styled to make it stand out, and it's attached to a topic. To get a broad overview your mind map. You can export the outline of the mind map in Text, PDF and MS Word file format for future use. 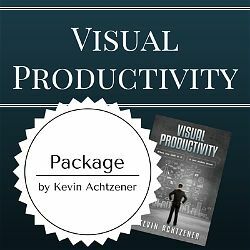 This allows you to save time and gain productivity. By printing the outline, your mind map becomes a list of ideas and sub-ideas in tree form. The ability to print from the index view has been on my wishlist for a while. The index view is a great way to look at information and search through it. It's a Pro feature that I think should be more prominent. You can use the Index view to scan for information quickly. The problem in the past was that once you found what you were looking for, you couldn't really transfer that info out. It looks like you still can't copy and paste from the index, which would have been nice. The ability to print helps a lot. Easily print a large mind map to multiple pages. By printing a large map onto multiple pieces of paper and then tape the pieces together, you won't lose any details of your mind maps. You can also spread them horizontally or vertically over multiple pages for a better overview or to display as a poster. I don't print off any of my mind maps, but I've had several readers ask for this ability. I'm excited to see how this can leveraged by seeing some large mind maps come to life. If you print one off, make sure you send me a picture and let me know how it goes. We introduce a new structure named Timeline. It can be used to display a list of the events in chronological order and the trends for a subject. You can also use it to help team members track milestones and time schedule of the project. Timeline is a new template to use. It's set to keep moving toward the right as you add more content – like you'd expect a timeline to do. You can use it as a project management and goal tracking layout to look into the future. I haven't played around much with this yet, but you can see from the image that it provides a nice clear look at upcoming events or tasks. I'm not sure how much effort this will take to setup to look like the example. XMind 7 packs 10 new amazing fonts! Fonts make mind maps more pretty, and prevent disappointment when opening your work on another computer without fonts you used. 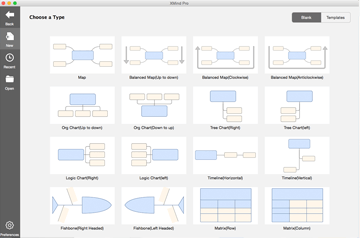 All our fonts are open source and cross-platform, which ensure your mind map looks good on both Mac/Windows. 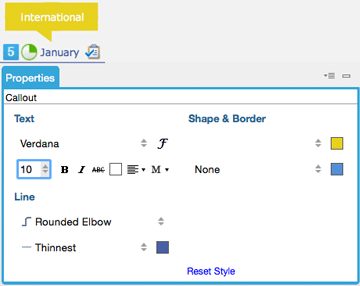 XMind 7 still add tens of new themes, with the new fonts. More themes and more fonts. This is definitely something XMind could use more of. I'm not the type of person who will sit down and try out themes very often, but I will spend some time looking into these ones. Having more fonts and themes to choose from means we'll hopefully see more diversity in the look of maps created using XMind. Which feature(s) stand out for you? 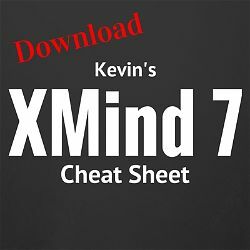 Which of the XMind 7 new features stands out the most to you? Is there something in particular you'd like to use right away? Something you don't see being useful? Feel free to start a conversation down below.